Ten years ago, Sashiram was a job-seeker with a limited education and uncertain employment prospects. Today, he is a solar technician who supervises the installation of solar home systems in multiple locations and is a four-time winner of “Best Employee” at an off-grid energy enterprise in Kundapur, near Manipal, India. People in the villages he serves respect him because he provides a basic need: He electrifies households that would otherwise remain dark or use kerosene lamps after sunset. “I bring light, and I am proud of it,” he said with a big smile. India launched a massive push for renewable energy in 2014 — a move that could bring more electricity and jobs to rural communities like Sashiram’s. The government set ambitious targets to generate 160 gigawatts (GW) of wind and solar power by 2022, a 400 percent increase from previous targets. A study from the Council on Energy, Environment and Water and the Natural Resources Defense Council estimates that to achieve this goal, India must create 330,000 new jobs over the next five years. A new WRI report, Can Renewable Energy Jobs Help Reduce Poverty in India?, finds that many of these jobs can provide steady incomes, healthcare benefits and skill-building opportunities for semi-skilled and unskilled workers. For India’s rural poor, especially women, these clean energy positions offer a lucrative alternative to subsistence farming. Like Sashiram, many people living in rural villages—home to 80 percent of the 270 million Indians living below the national poverty line—are searching for ways to improve their lives that don’t require them to migrate to cities. But few opportunities exist outside the agricultural sector, which employs more than half of the country’s workforce. India’s new clean energy jobs can be game-changers in these communities. Many positions in installation, operations and maintenance, and sales will go to unskilled and semi-skilled workers—those who lack the formal training or educational background needed to secure well-paid, permanent employment. In these positions, their responsibilities would range from installing panels under a senior technician to marketing roles like customer identification to monitoring plant performance. Permanent jobs come with healthcare benefits, safety trainings and capacity-building programs that help workers secure promotions. These permanent jobs can provide a reliable source of income that enables families to make smarter investments, save for unexpected expenses and plan for their children’s futures. Even temporary employees can improve their circumstances by acquiring transferrable skills on the job that enable them to continue working in the clean energy sector. In these temporary jobs, unskilled workers’ activities include clearing the ground for civil works, cleaning solar panels and providing security on project sites. However, poor people face many entry barriers to the clean energy job market. Most employers WRI interviewed for our report cited gaps in the technical and soft skills needed to succeed in the sector. Training institutes, which have sprung up across India, seek to address this hurdle, but most require applicants to have completed senior secondary school (class 12), putting programs out of reach for most. (Only 40 percent of rural Indian households have a member who has attained this level of education.) Institutes are also located in urban centers, far from rural communities. Women, in particular, find it difficult to travel for training, and they face a host of additional gendered challenges, from household duties to childcare obligations, that make it nearly impossible for them to participate in these programs. Even when people do overcome these obstacles and get trained, they graduate with limited job prospects. Training program curricula often doesn’t align with industry needs, and there are few communication channels between employers and the training institutes. The renewable energy sector is expanding, and the need for a workforce is obvious. But not all these new opportunities will reduce poverty. WRI’s report finds that positions fall primarily into two categories. Formal, permanent jobs for both semi-skilled and unskilled workers in the off-grid space often come with a regular pay, provide health benefits, follow safety standards and offer training opportunities. But majority of the jobs that are available to unskilled and semi-skilled workers =are those created during the construction stage of on-grid projects. These jobs are informal, temporary positions that lack stability and safeguards against losses, although they do provide an additional source of income. Some on-grid projects offer an opportunity for semi-skilled workers to enter into formal and long-term contracts for the operations and maintenance of the plants. However, these are much fewer in number, compared to those being created for construction. Decision-makers must embed innovative features that promote inclusion of India’s poor into the trainings, programs and policies developed for the renewable energy sector. Initiatives that create a sense of ownership, build rural Indians’ capacities and reduce the thresholds for entry to training programs can go a long way in generating employment for those who need it most. At the same time, training institutes must work with employers to identify which jobs are needed, which capacities to build and where such jobs are located. Past efforts to specifically include the poor have not been assessed, so it is difficult to make estimates of the number of jobs and their impact. Studies to capture this data and track the development of employees coming from poor areas are needed. This information will inform labor, industry, trade, environment, technology, rural development and urban planning policies; it will also help strengthen existing skill development programs and increase the quantity and quality of jobs. 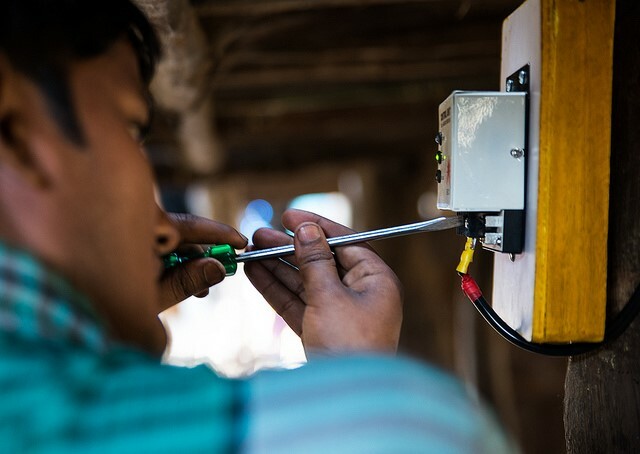 The benefits of transitioning to clean energy and electrifying rural communities like Sashiram’s extend far beyond employment opportunities. For the world’s poorest people, increased energy access means greater productivity, higher incomes for families and improved health. But the creation of good-quality renewable energy jobs, though less considered, is a crucial added dividend. India’s clean energy sector has a unique opportunity to establish itself as a role model for job creation in developing countries around the world. Decision makers from government officials to private sector leaders must act now and together.